Hello, reader friends and friendly readers. Our Lady of the Various Sorrows: Book Two in the Voices of the Dead series will be released on November 16, 2017. You can preorder now on Amazon Kindle and paperback, Google Play, and iBooks. It will be available on Barnes & Noble on November 16 and through Kobo, as well. And you can order a signed advanced reader copy from the store after November 16th. It won’t be an advanced reader copy so much at that point, but it will be a special edition as we only printed 20 copies. 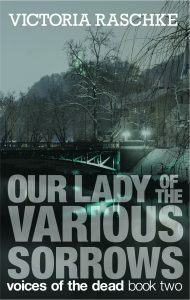 Holed up in a farmhouse in the Slovenian Alps, Jo Wiley is hiding from the personal demons and the dead who haunt her in Ljubljana. When she meets a secretive ghost from the area’s war-torn past, being alone becomes much less interesting. Before she can uncover her dead friend’s identity and agenda, her son’s father visits her in the mountains with his own dark secrets, and a cryptic warning. Forced from seclusion, Jo returns to the city to find things are even more chaotic than when she left. Vandals have attacked her teahouse and she and her chosen family are on the battle lines between ancient deities with human faces and humans who want the power of the gods. As more secrets are revealed, Jo struggles with how these new pieces fit together and where her place is in a world where her fate is more determined than she ever believed. As she gets closer to understanding the truth about her ex and her own past, it’s clear she may have to make the ultimate sacrifice to save those she loves most. But what if her sacrifice isn’t enough? And if it is, what are the consequences of thwarting fate?